They simply adore one another and love being able to do things together. The excitement levels (and accompanying volume levels) go sky high when they are doing something as a three. And the loveliest thing about school holidays - aside from the slower pace of life and not having to clock watch - is that there is so much more time for them to have fun together. Both the girls idolise their big brother and look up to him as some kind of hilarious, genius character that they want to be just like and also be best friends with. And he definitely likes being the eldest one who gets to look out for the younger ones and play the protective big brother thing. It's just the cutest thing watching them in action. 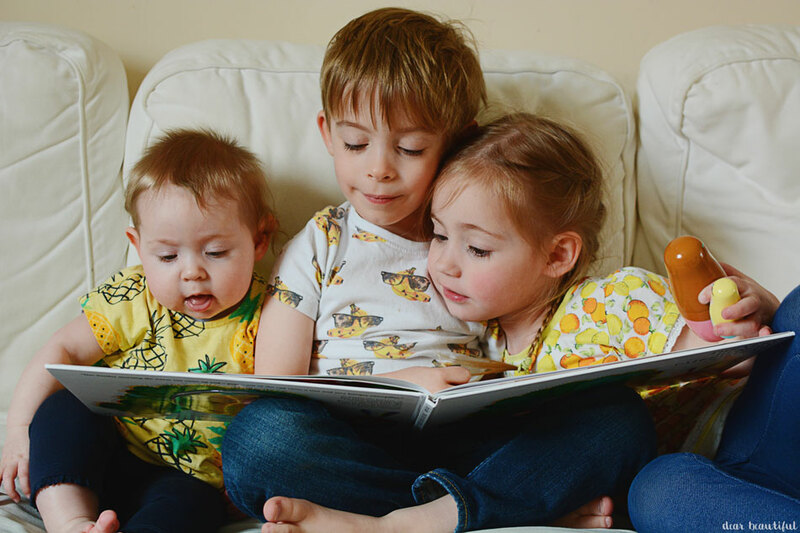 So I decided in the end to grab our photos for The Siblings Project at a time when the team of three thing seems to be at it's best; story time. 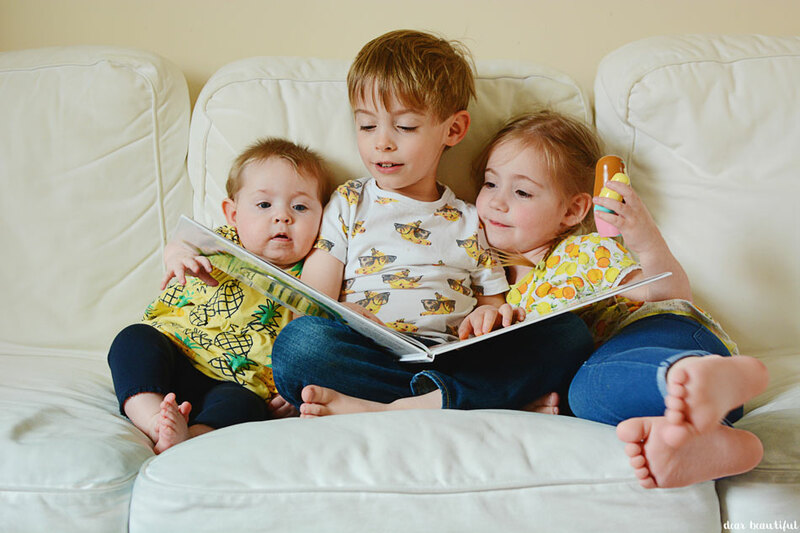 My big boy proudly reading to his sisters, and them hanging on his every word. I love the tangle of legs and feet on the sofa. I love how they are just so connected and so comfortable. I love their matching blonde heads. 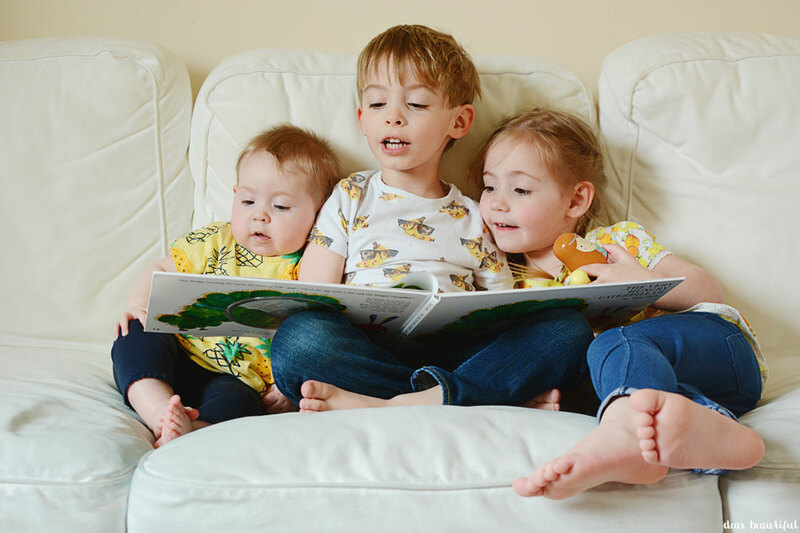 Three little bookworms. Seeing them together I see so clearly their similarities but also their differences, I suppose because no one on earth can know those quite like I do. Different pairings within the three share different things, and I wouldn't have it any other way. I love that I can look at them and see that they are brother and sister, that they are a set, that they 'go together'. But I love how different they each are in their own ways too, and how those differences fit together but make them each their own unique person. 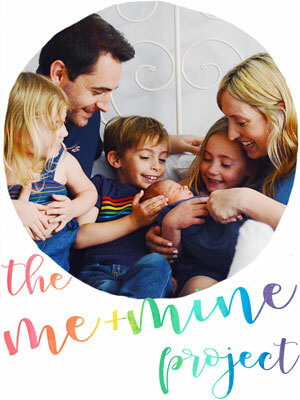 And because I know that no one will believe for a second that my three children are always the adorable, quiet and angelic creatures they were during their story. Here is a photo taken second later, when I tried to get a "nice smiley one"... life is never boring with this crazy bunch! Do pop by my cohosts Katie, Carie, Keri-Anne, Amber and Annie too to see what they've been up too. And link up your posts in the linky at the bottom, I can't wait to see all your photos. 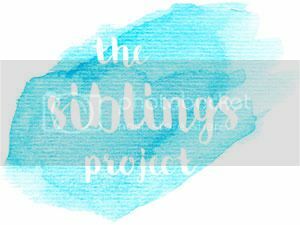 And don't forget that The Siblings Project is also on Instagram, so do go over to @siblings_project_ and give us a follow. 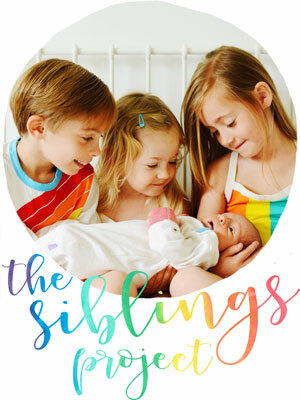 Add #siblingsproject to your photos and then we'll be sharing some of our favourites. And it can be any sibling photos, not just the ones you link up for The Siblings Project blog post. We already have quite a gorgeous collection of sibling moments on show. Aww bless! 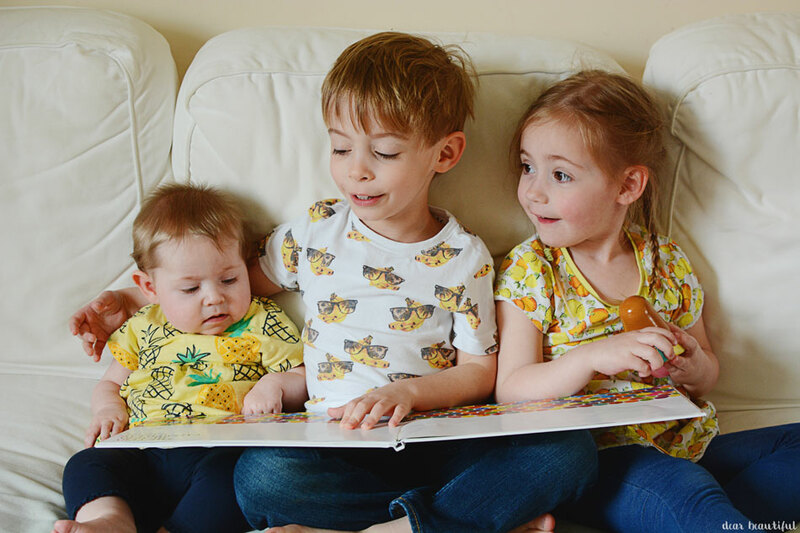 They do look chocolate box adorable having a little story time but it's the outtake that made me giggle - possibly because it's so very familiar to my attempts to take pictures of my three!! 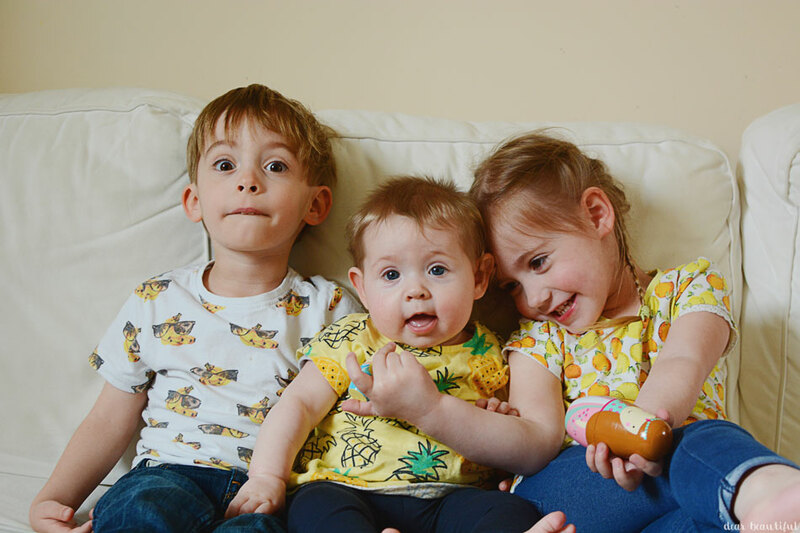 I remember watching Pip get to an age where he started to 'count' in the girls' eyes and it's so much fun to see that leap forward in the relationship and the first signs of a trio - enjoy!! Gorgeous photos; such a lovely moment to capture. They look so sweet together and lovely how your boy is reading to them. Such gorgeous pictures Lucy... Storytime! Why didn't I think of that?! Mine were disastrous this month! But I suppose not an unrealistic representation of life with three! Storytime!!! That's it! Thanks as always for hosting lovely lady! Wonderful. And so encouraging as we head towards having three. I'm so intrigued to see how our dynamic changes. 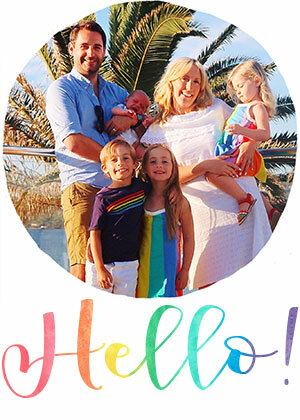 It's lovely to see the strong bond they share - a bond that will continue to grow. So precious! You can see just how wonderfully close they all are, so lovely to have a bond like that.